With a 100% cow print fabric on the top and then ivory cuddle fur fleece on the reverse you will turn heads wherever you go! It is just like stroking your very own angora rabbit! 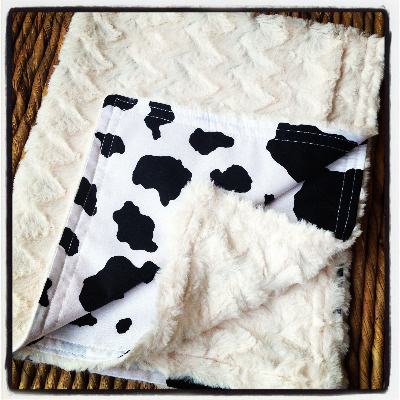 Perfect for car seats, buggies,cots and simply as a snuggly blankee! Our baby snuggle blanket is soft to cuddle and easy to carry while it helps to stimulate your child's senses. This is a special bespoke handmade gift! This snuggle blanket is sure to be your child's favourite security blanket!